Frederick William Herschel, KH, FRS (15 November 1738 – 25 August 1822) was a German-British astronomer, composer and brother of fellow astronomer Caroline Herschel, with whom he worked. 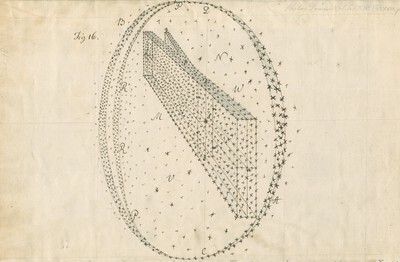 Herschel constructed his first large telescope in 1774, after which he spent nine years carrying out sky surveys to investigate double stars. The resolving power of the Herschel telescopes revealed that the nebulae in the Messier catalogue were clusters of stars. Herschel published catalogues of nebulae in 1802 (2,500 objects) and in 1820 (5,000 objects). In the course of an observation on 13 March 1781, he realized that one celestial body he had observed was not a star, but a planet, Uranus. This was the first planet to be discovered since antiquity and Herschel became famous overnight. As a result of this discovery, George III appointed him Court Astronomer. He was elected as a Fellow of the Royal Society and grants were provided for the construction of new telescopes. Herschel pioneered the use of astronomical spectrophotometry, using prisms and temperature measuring equipment to measure the wavelength distribution of stellar spectra. In addition, Herschel discovered infrared radiation. Other work included an improved determination of the rotation period of Mars, the discovery that the Martian polar caps vary seasonally, the discovery of Titania and Oberon (moons of Uranus) and Enceladus and Mimas (moons of Saturn). Herschel was made a Knight of the Royal Guelphic Order in 1816. He was the first President of the Royal Astronomical Society when it was founded in 1820. He died in August 1822, and his work was continued by his only son, John Herschel.